Mountaineering and amazing food are not words you would expect to find in the same sentence. What would I be eating on a mission to photograph the glaciers in Iran? Restrictions on weight and space, and the need to keep ingredients fresh really limit what is possible to conjure up on a single burner in a freezing camp, amid snowy peaks and barren landscapes. I was documenting the vital glaciers of this beautiful yet forbidding land as part of Project Pressure, a charity I've set up to highlight the impact of climate change on the world's vanishing glaciers. Project Pressure uses art combined with scientific research and data to inspire action and participation. Today you can find glaciers in three regions in Iran. They are all relatively close, less than a day's journey between the various mountains, but the contrasts are stark. I was hot by the Caspian Sea, 28 meters below sea level, but there are glaciers on the nearby mountains towering almost 5000 meters. On our glacier mission we encountered a very varied landscape, it was as inspiring as the food was disappointing. We had a local mountain guide who was also supposed to cook, a common practice on these treks. But this man's gastronomic ambitions never ventured beyond what could be sourced from a tin. He hated cooking and could not care less about the food. I found the whole thing rather depressing, so I offered to cook. The landscapes, full of tasty-looking crops and intriguing food stalls, should be enough to whet anyone's appetite. 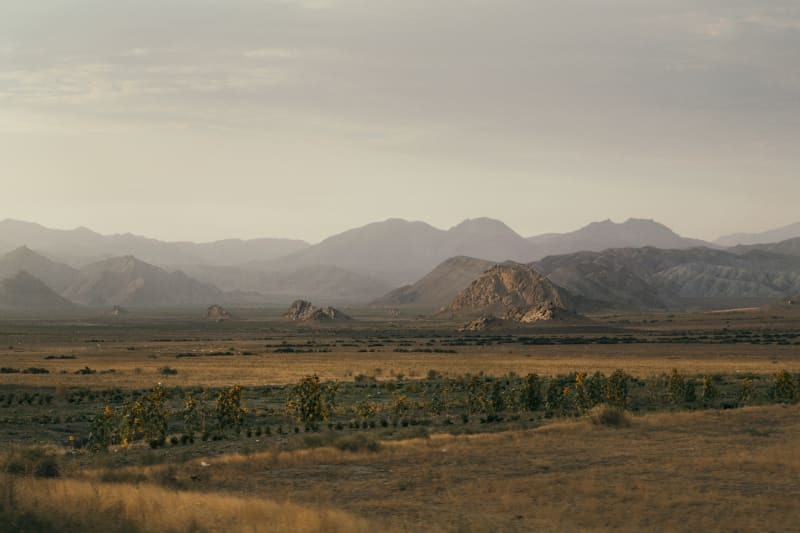 A lot of Iran's produce is sourced from its 'green belt', an area from the 4,000-meter high ranges of the Alborz mountains slopes all the way down to the Caspian Sea. Between the two are panoramic landscapes of rainforests and lush landscapes. I saw fields with tropical fruits, rice and loads of tasty looking vegetables in the valleys; the climate allows to harvest three times a year. We stopped to buy melons in a roadside shop where the tarpaulin outside was overflowing with ripe water and honey melons, which we cut up and had for breakfast the next morning. Most times, food shopping was straight from the source. On our way to reaching Mount Sabalan we stopped in a small town and picked up fresh chickens and herbs. At the foothills of Sabalan, a small river was flowing. This was the hub of the village and was used for everything, from people washing themselves (mostly upstream) to cleaning knives and tools when butchering sheep (mostly happened downstream). The sheep were killed and butchered in the clean running water and then pumped full of air so the skin would balloon up and could be removed easily. Then each organ was rinsed individually in the river. After about fifteen minutes the whole animal had been cut up, intestines cleaned out and everything ready to eat. We were short on time and opted for a taste of the local kebab; these nearly always consist of variations of the goat. The goat meat is cooked on skewers over charcoal and served with salad and a piece of bread. It does get a bit repetitive but tastes great. Next we headed up the mountain and a few hours later we were setting up base camp at the American Mosque, where we stayed a few nights. 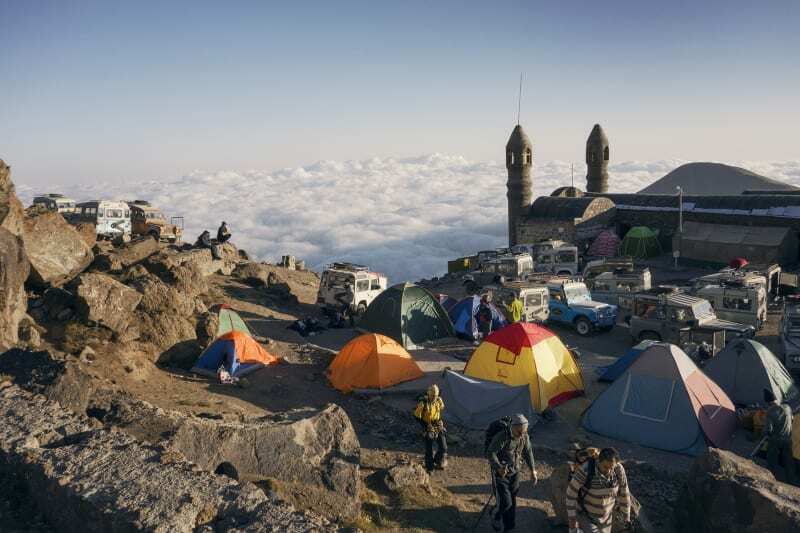 The American Mosque was built by American soldiers during the Second World War, and is now used as base camp for locals wanting to summit Mount Sabalan at 4,811. In winter, the mountain doubles as a ski resort. We got to the mosque on a weekend when local climbing crews gathered; we shared food, pans and ingredients. That evening I cooked a chicken and rice dish, seasoned with local saffron (very cheap in Iran), chopped tarragon, chilies, and mushrooms fried in olive oil. On the way back to Tehran we stopped for snacks in a kiosk, where the ice-cream poster would have raised child protection alarms in other places but didn't raise an eyebrow here. As we left the mountains behind, I bought an ice cream as my “expedition cooking” had come to an end. I was now ready to go and explore Tehran. Article previously published in VICE.